I finally did a bit of monoprinting over the weekend, and after my first one or two less-than-spectacular results, I resorted to printing and stamping directly on paper and fabric...actually, my preferred method of working anyway. I'll have another go with monoprinting in the near future but I've gotten busy with other things for the time being. 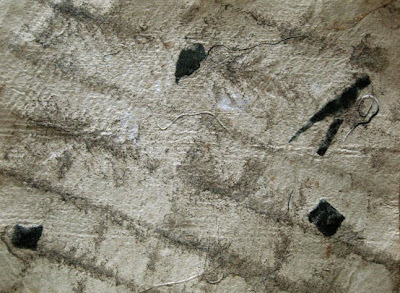 Years ago, when I lived in San Francisco, I took a papermaking class at Magnolia Editions in Oakland, and thus began my infatuation with handmade paper. 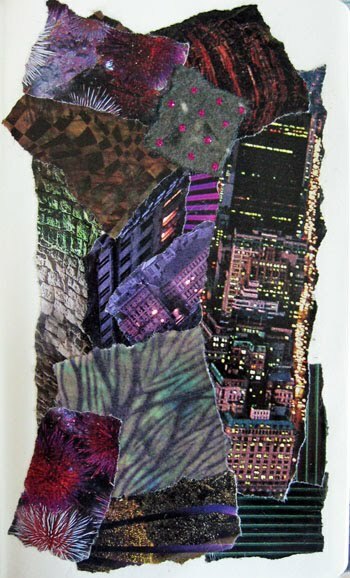 I did several sessions on my own following the class, and produced a small stack of paper incorporating bits of fabric, unusual paper, thread, glitz and what-not. The first three images here what I did on my handmade paper this past weekend. 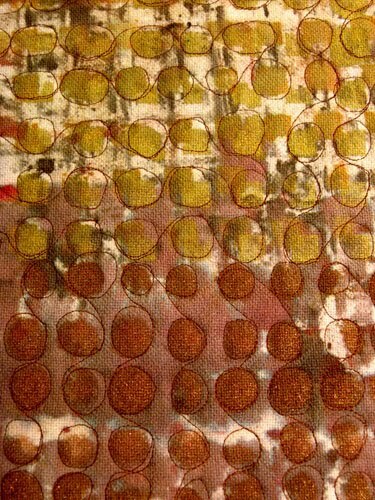 The last image below is a piece of sketchbook paper, monoprinted then overstamped. I like it a lot. I love the results of print on paper and I'm sure I'll do more in future. 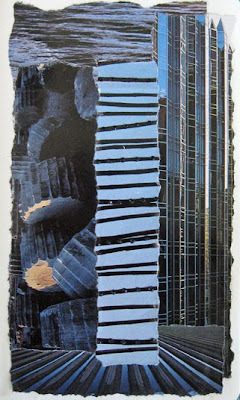 My most recent four sketchbook collages have been posted on their Page. I printed fabric, as well, over the weekend, and I'll upload that in a day or two. 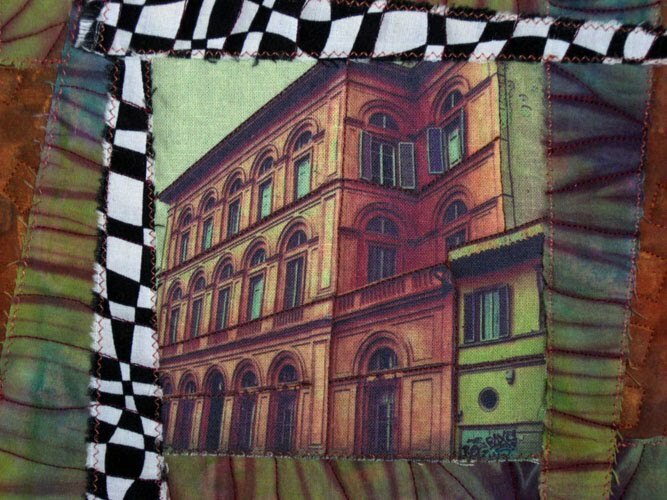 Also completed, another 12x12" Italy quilt. Soon as I figure out what to call it, I'll post that too. I'm really stoked about having five creative days ahead of me. With my busyness of earlier this month, a longer than usual weekend hasn't happened in a while. The collage above is a new one, in a larger format, 15x18 inches. 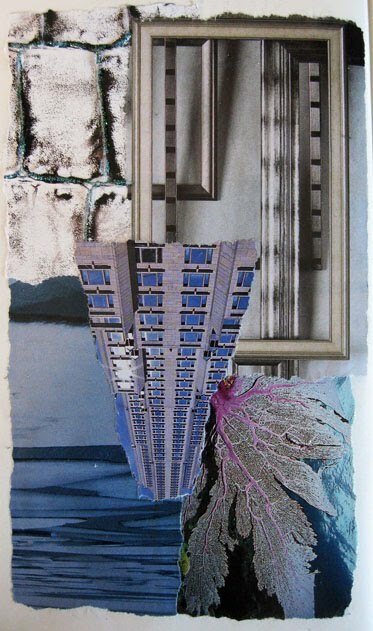 And the piece below is one of my four latest Sketchbook Project collages. See them all here. I'm working my way back to the front of the book, and each new page -- the back of an earlier collage -- is compatible colorwise with the piece facing it. I'm at that point where I'm looking forward to finishing up and mailing it back to the Brooklyn Art Museum. Time to move on to other pursuits. I got several new art books this week that I want to share with you...the first one is Ruth Issett's Print Pattern & Color. I'm especially excited about this one as I'm finally getting to print fabric again this weekend. The next is Linda Johansen's Fabric Dyer's Dictionary. This book is about using fiber reactive dyes, but one of my students brought it to the acid dyeing workshop a few weeks ago. Fabulous recipes for exciting colors. 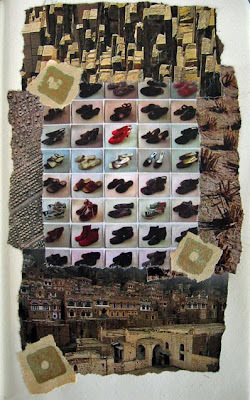 Then there's Sherrill Kahn's Creative Mixed Media which I'll get to eventually. 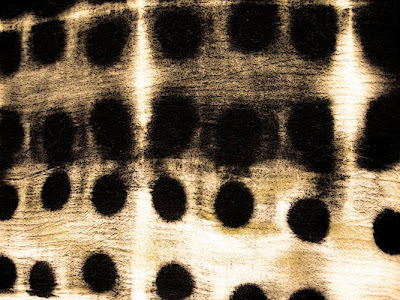 And last, but certainly not least, Gail Callahan's Hand Dyeing Yarn & Fleece. Although I'm not dyeing yarn or fleece these days, there are so many new and different methods of dyeing in this book that I just had to have it! And the dyeing is done with acid dyes, which are near and dear to my heart. In other news, I finally got back to quilting this week. In fact, I finished my "stretch" challenge quilt last night. I won't be able to show that until September 15. I'm quite happy with the way it turned out. I just posted five new Sketchbook collages on their Page. About all I've gotten done in the last few days has been collages. But my really busy time with other stuff is officially over...so now I can slowly get back to the numerous art projects on the burners. Today I decided definitively to do the backs of the pages in the Sketchbook collage journal, starting from the back and moving forward until I'm back at page 1. Then I'll fashion a closure for the ever-thickening book. Totally off topic but I want to share it with you -- I just watched Michael Jackson's This Is It DVD and I totally loved it. If you haven't seen it yet -- if you're a laggard like me -- then definitely see it. And don't forget the bonus stuff on the disk -- especially the chapter about costuming. The textiles those designers created, incorporating amazing technology and cutting-edge materials, are not to be missed. 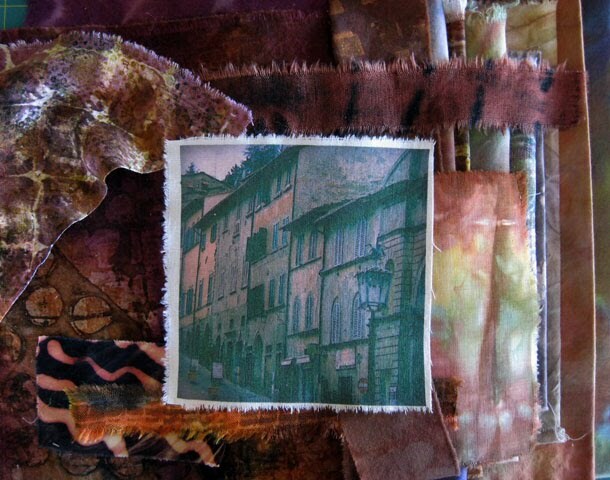 I have a multitude of techniques that I hope to get back into sometime soon -- monoprinting, stamping, printing with thickened dyes, discharging. Stay tuned to see what develops. First up, though, Fiberactions' stretch-themed quilt, just waiting for more variegated thread before I start quilting. I expect to have it finished by this weekend. I have four quilts-to-be that I previewed fabrics for not long ago that I've decided to make into its own small series, or four pieces that go together, whatever that's called. 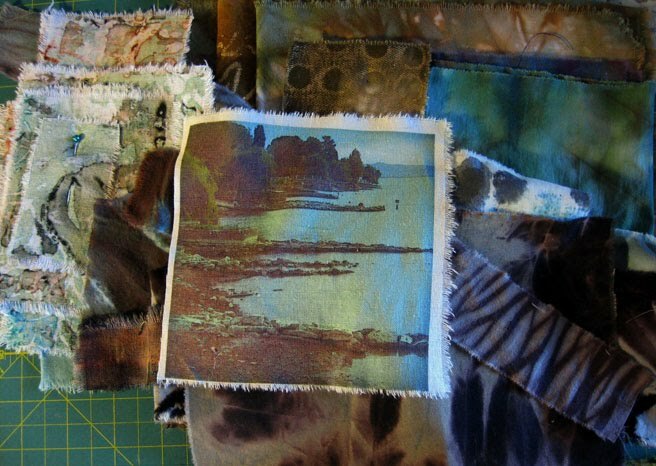 And that new series of smaller pieces, two of which I also have nearly ready to quilt. And more Italy pieces ready to go. Wow, lots to do! A couple of random images I've had in my upload folder for a week or so... 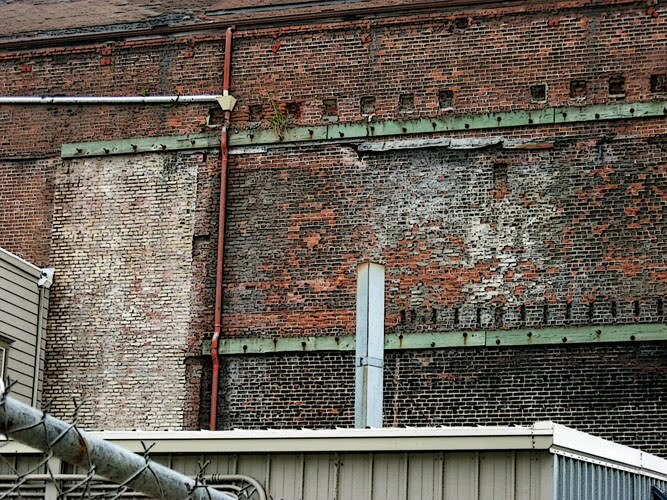 Above, the back of a building in Old Town Eureka. Talk about lines and grids! 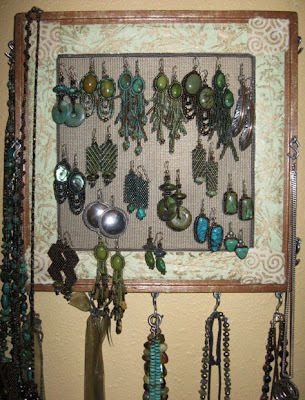 This is a small jewelry holder I created over the last couple weeks. The outside dimension is only 11x11" and I'm able to get everything on it that I wear. Most of the jewelry, as you can see, is my own work. I made a decision some years back to wear my own jewelry almost exclusively, despite loving so much other artisan jewelry. I've never had the discretionary income to load up on others' work, and if I get tired of something, I don't have to feel guilty for buying it and then no longer wearing it! And these are the two latest sketchbook collages. I'm just about finished going through the book on the fronts of the pages. Now I'll do more on the covers including some kind of unobtrusive closure, and then I'll decide whether or not to collage the backs of the pages. 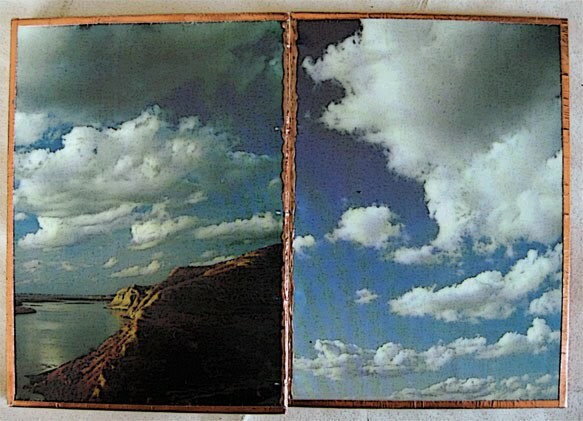 Maybe I'll do something entirely different for the backs, e.g., not collage. We'll see! 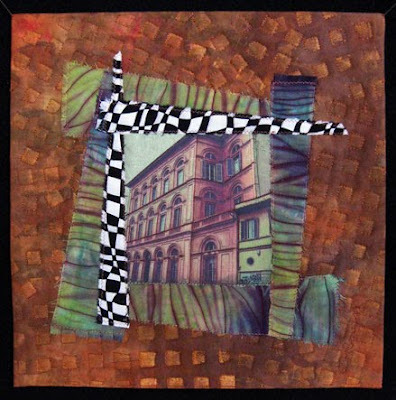 My latest 12x12" Italian piece -- Prospettiva -- finished this afternoon. I never got to the monoprinting this weekend...perhaps later this month, or next. I have gotten a lot of framing done, however, and a smattering of other small projects. 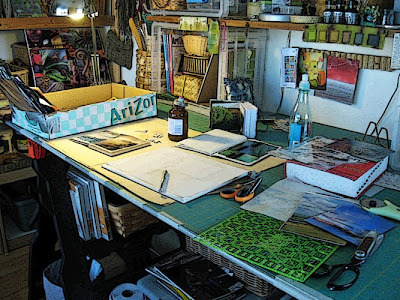 I just posted several sketchbook collages on my Page. I had a wonderfully productive day today -- and the sun even came out. Which made me feel just a wee bit guilty for being inside most of the day! The little journal above is just 4x4" and I've made a good start on it. 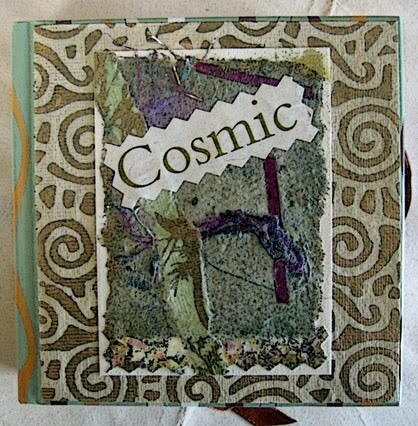 I added some cool paper to the cover, along with my first ACEO (boy, was that fun to make!). The second little journal was a gift from uber weaver Alice Schlein, one of her first handmade books. Alice had used a fudgsicle carton for the covers, and I recently recovered them with sky photos -- which inspired me to focus this little journal exclusively on embellished photos of the sky! If you're another sky fan, check out my weekday sky images here. 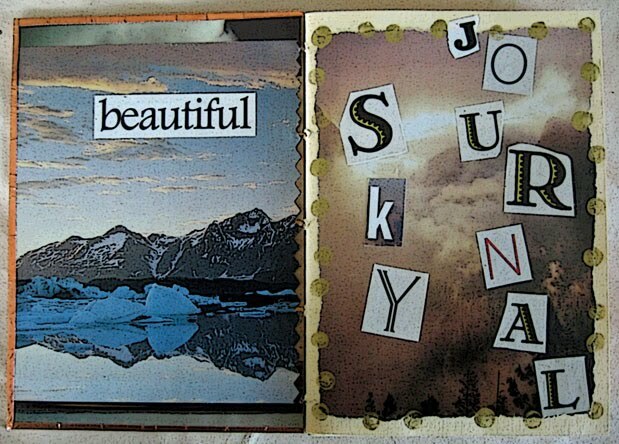 The best part of these little collage journals is that they're just for moi. So I'm really exercising my permission muscle, letting myself do whatever comes to mind in the moment without censoring anything. Most pages I like, some I don't, but it doesn't matter. The important part is that I'm trying a lot of different things, letting the books evolve without feeling as though I need to do the entire journal in a particular fashion just because I might have started that way. The little pillow is another work in progress. 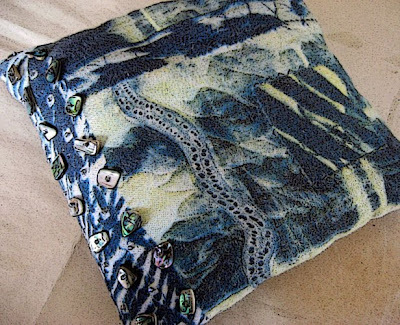 I had two digital images of an early quilt, on two different fabrics, sitting in my fabric image box, and I had no other use for them so I sewed them together and made a small pillow. Slowly, I'm embellishing it. I spent the afternoon assembling the top for the "stretch" challenge quilt. 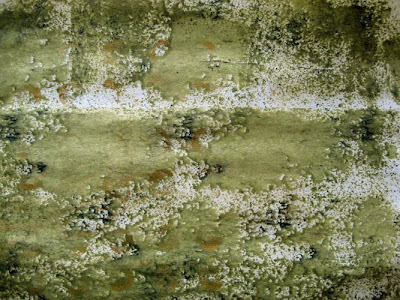 You can see a sneak preview here of the fabric I dyed to use for the foundation and backing. 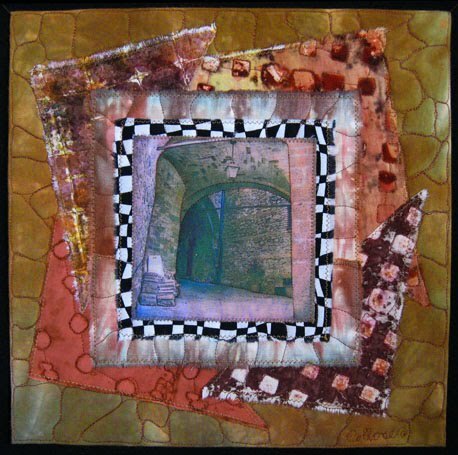 Another thing I've been working on recently is mounting my best 10x10" weekly quilts from 2009 on stretched canvas, one at a time. Each canvas gets painted specifically to go with the quilt that will be mounted on it. I really like the way they're turning out. And, I have an idea for another small quilt series and anxious to get started on it soon. I'm liking working small -- lets me try a lot of different things without an enormous commitment to just one idea. My latest three Sketchbook Project collages, also just posted on my Page. In between making collages this week, I've dyed a couple pieces of fabric as possible candidates for my Stretch challenge quilt. The first piece, while lovely, won't fill the bill for the quilt. So I have another batching and will finish it off this morning. 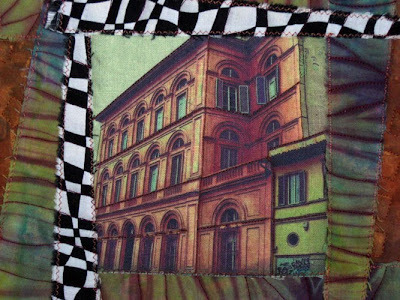 The really cool news is that two of my quilts were accepted into "simply irRESISTible," a show of resist-related textile art opening September 12 at some things looming gallery in Reading, PA. Can't tell you how excited I am about this -- there are only 24 artists in the show, and 37 pieces. And two of them are mine! I'm really looking forward to this weekend -- no plans other than studio time and I'm planning to move forward on a few fronts. I promised myself I'd do some monoprinting this weekend, and I've been pulling materials together to do that. 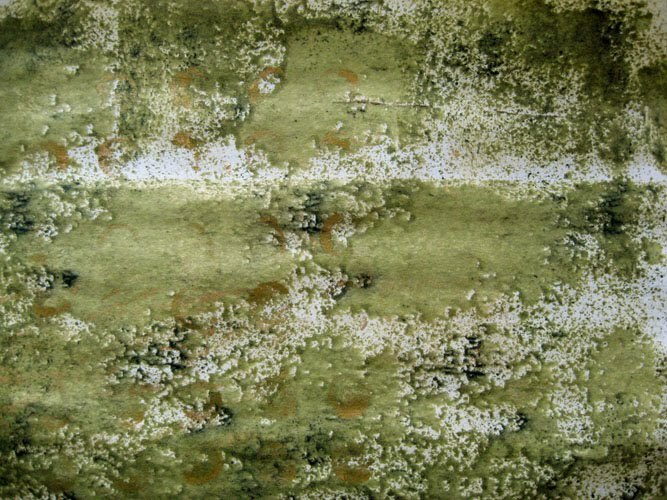 I'm focusing on using paint rather than dye, and can't wait to see what happens. I've only done it with thickened dyes in the past, and haven't been especially happy with the results. So look for more photos sometime this weekend. This is my 100th post for 2010 on this blog. Sounds like a lot to me -- although it is fewer posts to date than 2009, and significantly less than 2008, my first year of blogging. I'm going to take the view that fewer blog posts means I'm being more productive in the studio than at the computer. A good thing, indeed! 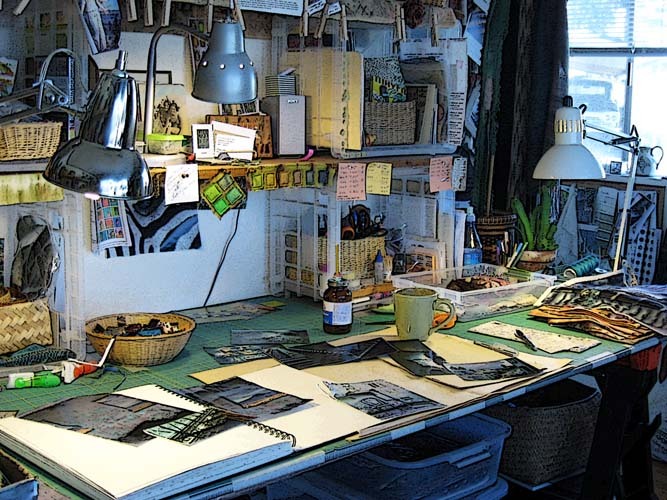 Two recent views of my workbench...you can see lots of collage happening. 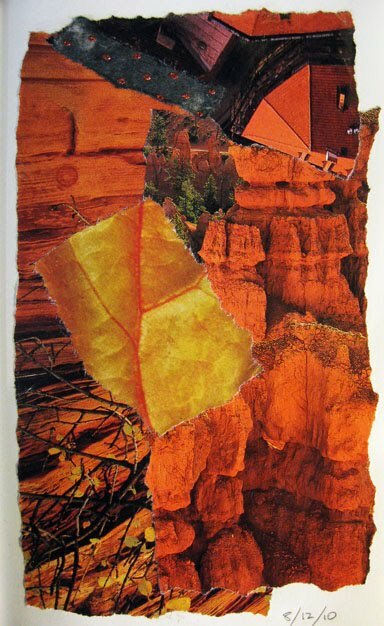 I've started two small journals of collages, seen in this photo. I'll post images of the beginnings of them later. 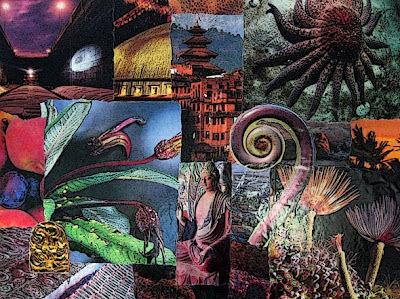 Speaking of collage, I just posted the latest three Sketchbook Project pieces on my Page. The workshop last weekend was great fun. 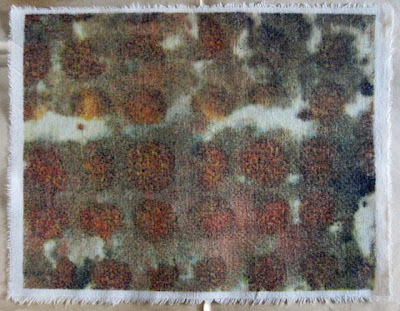 Wish it had been more of a controlled environment for dyeing, though, as some of the results weren't as I'd hoped. 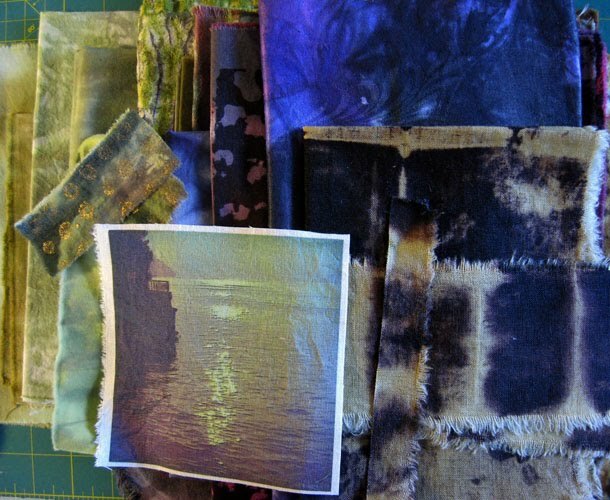 The gist of it, though, was to teach folks how to do their own dyeing with acid dyes, rather than produce a bunch of cool dyed stuff at the class. I'm quite sure the message got across. I have a yard of fabric batching as we speak for the foundation cloth and backing of my "stretch" themed quilt, Fiberactions' current challenge. Later today I'll know for sure whether the idea I'm working on will fulfill the challenge or whether I'll have to move onto the next possibility. Getting a very late start this morning -- it's 9:15 and I'm still in my jammies. Our recent North Coast weather, though, doesn't exactly make you want to jump out of bed in the morning and greet the sunshine...WHAT sunshine? 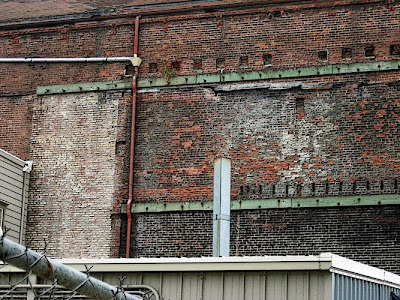 In the last couple of days I've done some interesting experiments with digital imagery -- interesting in that as I often do, I've been mixing metaphors...or in this case, doing things "you're not supposed to do." AKA, breaking the "rules" for how products are supposed to be used. 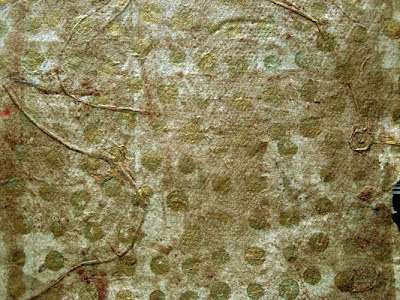 This third image in this first series, just below this block of text, is a photo of an early quilt, Skipping Stones. I took a lot of images of this quilt, and one in particular intrigued me. That image is just above -- a piece of a photo, cropped, blown up, digitized. 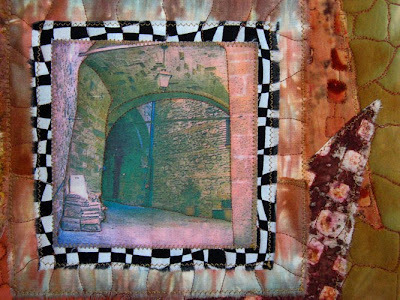 I've printed this image on several kinds of fabric and used pieces of it in other quilts. The image on top is of a piece of linen I just printed with the same image on my Canon ink jet printer. This time the image was printed on a sheet of Lasertran and then transferred to the fabric with a 50/50 mix of acrylic matte medium and water. 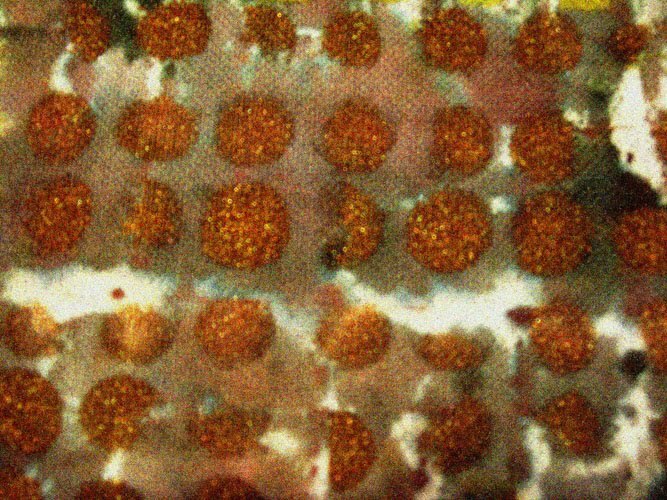 The medium was brushed on the fabric with an even coat, the printed side of the Lasertran was turned over onto the medium, and the image was burnished onto the wet fabric. The mixed metaphor part of this is that Lasertran is made to be used with laser copies and this version of Lasertran was meant to be used on silk. 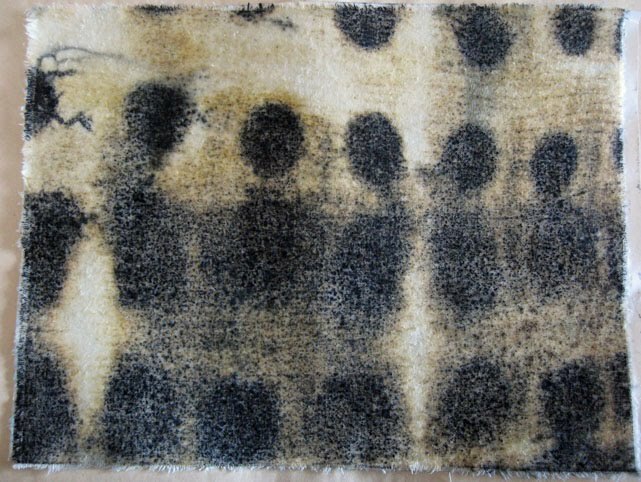 Normally the way you use the product is that you iron the printed image on your fabric with a hot iron, then you soak the fabric face down in a pan of water until the backing paper falls off, then carefully lift the silk out of the water and iron again until it's dry. Lasertran has never worked for me...although truth be told, I've never tried it with laser color copies -- they're too expensive, I have to go elsewhere to have prints made, etc., etc. So I've kind of been wanting to use this stuff up by trying any which way I could to get the printed image from the Lasertran onto fabric. The result: transferring to fabric with acrylic medium worked better than I imagined and I'm happy with the final image on fabric. Another product I tried this week is T.A.P., or Transfer Artist Paper. This stuff enables you to print an image onto a sheet of coated paper, turn the image over onto fabric, and iron on hot until the image has transferred from the paper to the fabric. The result was so bad, I threw it away! My apologies to Lesley Riley who developed T.A.P., but it just didn't work for me. The ink colors shifted quite a bit from what they should have been, not all of the image transferred to the fabric despite the amount of heat, and the fabric was stiff with the plasticky feeling that image transfers often -- usually -- have. I did a second experiment, though, with Lasertran. After the image was printed, instead of transferring it to fabric treated with acrylic medium, I transferred it to a piece of fabric that I had previously treated with Bubble Jet Set. In lieu of medium, I sprayed the dry fabric until it was damp, turned the image side of the Lasertran onto the fabric, and burnished. The resulting image is rather ghost-like, but it still works for me. And the fabric is mildly stuff, but not as much as with medium. The top piece of this set is the Lasertran to bubble-jet-setted fabric, the image below is my original digital image of discharged fabric with minor manipulations including a sepia filter in Photoshop Elements. And the bottom image is of the quilt that the original discharged fabric became. A caveat ~ burnishing is very hard on the upper body. It definitely hurt my wrists, hands and arms because of the pressure necessary to get the image to release from the backing and adhere to the fabric. 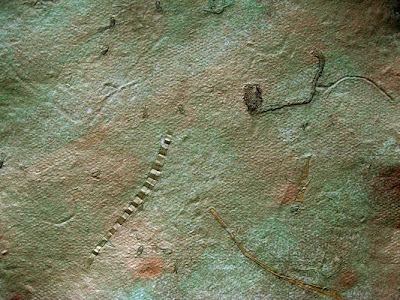 And one transfer can require 10 or more minutes of burnishing. Upshot: I still vastly prefer Bubble Jet Set for digital imagery. But I'm glad to have options in my toolbag. 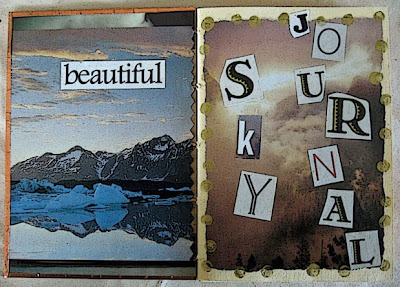 Friday and Saturday's Sketchbook collages are on my collage Page. I've been at it again ~ pawing through my stash for candidates for new quilts. 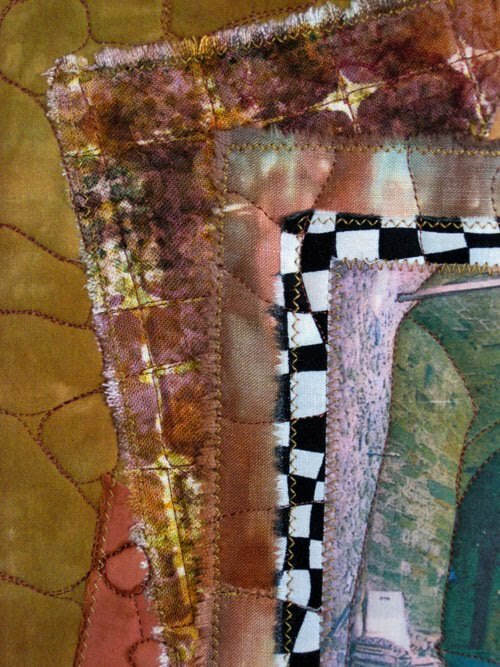 I especially love this part of quilt design. 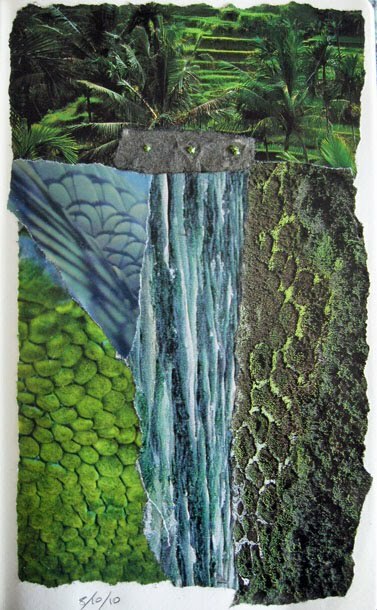 I just posted two new collages to their Page on my blog. Final prep for my weekend class today, and I'll be setting up at Sproule Studios this afternoon. Doing some new experiments with digital imagery. I'll upload photos when I've got a few things to share on this front. I was feeling iffy about this piece, until I quilted it today. Glad to say it turned out better than I imagined. 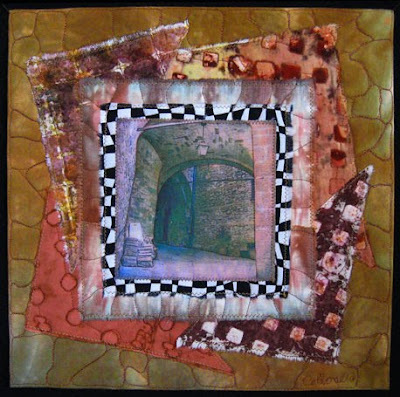 Sometimes things just really work, and everything about this 12x12" quilt works for me -- the image, the shapes, the quilting. It's called Secret Passage. I think I haven't mentioned this before, but I am working on this 12x12" series of Italian images for one of my two local shows next year. And it's a good exercise to work in a series that holds together, one or more elements common to all of them. I am aiming for at least 12 pieces, with a stretch goal of 18 or more. Secret Passage is number 7. A lot has been written about the value of working in series, and I'm finding it enlightening to be working thus. I know I've wanted to quit this one a few times -- not because I'm not enjoying the fruits of my labors nor because I don't like them (I am and I do), but because I fear falling into a rut, repeating myself, making formulaic work. 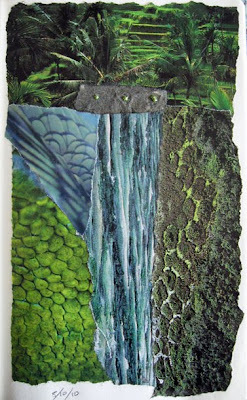 Of course it's likely way too early in my art quilting career to be worrying about these things...but I do want to keep things fresh, I do want to mix things up often, I don't want to do too much of the same thing. If for no other reason than the boredom factor. But no, I am not bored with this series. And in fact, after being away from it for a couple of weeks, I see some gradual shifts. So I am newly ignited. 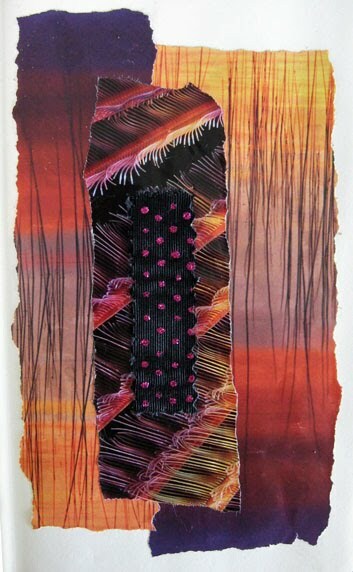 Today's Sketchbook collage is posted here. Yesterday I shiboried an orange cotton t-shirt for Scotty to donate to a raffle, and I threw some odd pieces into the pot. The dye color was a dark brown (black plus Dharma's rust brown) and it worked perfectly on the t-shirt. 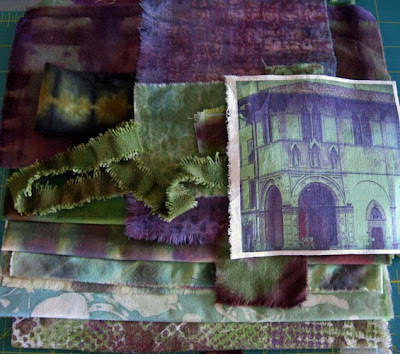 I got some really interesting results, shown here, on the other fabrics. The two pieces with blue in them were from last week's teal/turquoise/electric blue shibori, then overdyed yesterday. 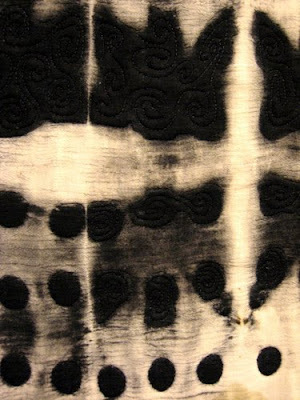 The piece at upper right is raw silk -- black fiber reactive dye turns burgundy on silk. The middle top piece is homespun cotton. 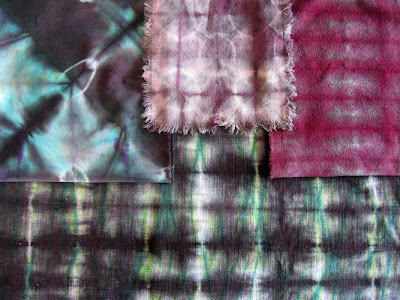 There's so much mystery involved with fiber reactive dyes, far more so than with acid dyes...which I've been thinking about a lot this week, as I prepare for this weekend's acid dye workshop. Yesterday's Sketchbook collage has been posted to my blog Page. Last night on PBS I watched the concert from the White House honoring Sir Paul McCartney's winning the Gershwin Prize for lifetime achievement in popular American music. The concert itself was terrific -- numerous musicians singing their versions of some of Paul's songs, and Paul himself doing several with his band. If you have the chance to see it, don't miss it. What really inspired me, though, was the subtly changing colors on the drapes in the background. I was struck by the awesome color contrasts -- in particular, brilliant orange and metallic aqua. I usually go for monochromatic or analogous colorways, so it's interesting that big color contrasts are "up" for me at the moment. 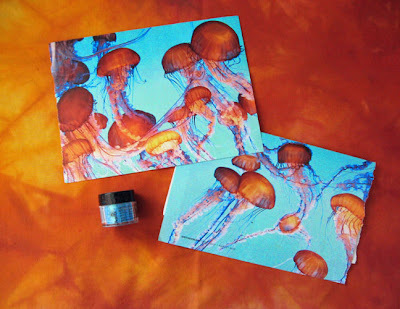 I fished out this brilliant orange cotton I dyed a while back, and my aqua PearlEx metallic pigment -- and then came across these images of jellies recently added to my big box of collage fodder. Now I know why I was so attracted to the images...apparently something is moving me in this directly colorwise. So I'm curious to see what I do with this electric combo. I've created a Page on my blog for Sketchbook Project Collages, and new ones will be added there instead of the blog proper. I've been missing my work with fabric...so I'll have to get back to fiber arts for my primary blog posts. Whatever it takes!